Quantity: For each 7-quart canner load, you need an average of 16 pounds of fresh apricots. For each 9-pint canner load, you need an average of 10 pounds of fresh apricots. A bushel weighs 50 pounds and yields 20 quarts to 25 quarts — an average of 2-1/4 pounds per quart. Quality: Select firm, well-colored, mature fruit. Look for fruit at the ideal stage for eating fresh. 2. Wash apricots. Skins may be left on or removed. To remove skins, dip fruit in boiling water for 30 seconds to 60 seconds until skins loosen. Dip quickly in cold water and slip off skins. 3. Cut in half and remove pits. Slice if desired. See prevent browning. 4. Prepare and boil a very light, light or medium syrup, or pack in water, apple juice or white grape juice. See Syrup Pack. 5. 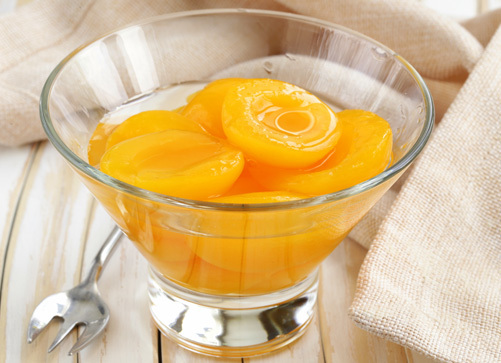 Apricots may be Hot Packed or Raw Packed. Note, raw packs make poor quality apricots. Hot Pack - Place drained fruit and syrup, water or juice in a large saucepan and bring to boil. Fill jars with hot fruit and cooking liquid; leave 1/2-inch headspace. Place halves in layers, cut side down. Raw Pack - Fill hot jars with raw fruit, cut side down and add hot water, juice or syrup, leaving 1/2-inch headspace. Process Times in a Dial-Gauge Pressure Canner. Process Times in a Weighted-Gauge Pressure Canner.